Yes that’s correct. I am a social media, Web 2.0 failure. For until Sunday morning I had not been at all bothered with QR codes. I didn’t choose that weekly activity last year during Information Programs. And I am the kind of person who keeps forgetting what the Q and R actually stand for. I think the little squares are aesthetically interesting. I have a smart phone. What was holding me back from jumping on the QR code bandwagon? Well, they seemed like a bit of a gimmick, an extra, superfluous to my information needs. Of course, that was my untried and untested opinion. 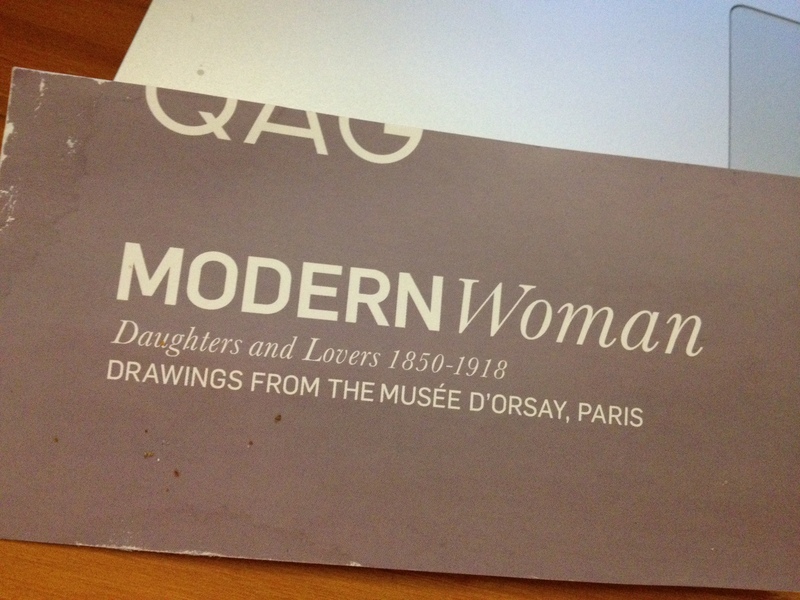 So on Sunday morning when I popped along to the Modern Woman exhibit at the Queensland Art Gallery I decided I should make a slightly more informed opinion about the codes and actually try them. Verdict? Well it was simple enough to download the QAG app and reader after my snap decision once I was actually in the exhibition. And the technology worked beautifully. It was probably a pity that I didn’t have headphones with me though because I had to hold my phone up to my hear so I didn’t disturb the other visitors to the exhibition. That meant while I could hear the little talk that added to my knowledge of the art, I missed seeing the extra images (given that the phone was stuck to my ear). I also found that by the time I had scanned the code and started listening I had actually already seen enough of its accompanying artwork and was ready to keep moving around the exhibition. I felt that I had to stand there though until I finished listening to the extra bits before moving on or my experience of the exhibition would have been “out of synch”. This disrupted the flow of my experience of the exhibition to some degree. I don’t know that I will bother with them again in a gallery setting. Do I need to try QR codes again in a different setting? Yes I probably do. Am I going to put that at the top of my list of things to do? Probably not. I might save that up for a rainy day. It’s week 5, term 1, 2012. I’m starting to feel like I may have bitten off more than I can chew. I decided to take two units this term instead of the paltry one per term I did last year. What does this mean? Well it means, I constantly either working on an assignment or thinking about starting the next assignment. That’s okay. I mean for goodness sake, I finished a PhD while working full time at uni and teaching the piano after work. Surely I can do anything? So, little bit of stress bunniness aside, I am enjoying the units this term for the most part. Unexpectedly, I am finding I am getting more out of Management Issues for Information Professionals than Collection Management so far. If you had asked me at the start of term I would definitely have predicted it would be the other way around. I’ve been wondering why this is and I think it’s that so many of the topics in Mgt Issues connect to what is going on in my real life at the moment. It’s been really useful to read about issues like change management and innovation when these are being experienced at the same time at work. In other LIS related news, my abstract for RAILS8 was accepted. Exciting times ahead. I have sent away all my forms and registration. Now I will just have to plan to cut my 14000 word minor research project on GLAMs down to a 5000 word, 25 minute presentation. Luckily it’s not until June so I have lots of time. That’s what I keep telling myself anyway. I have just submitted my minor research project. Hurrah! 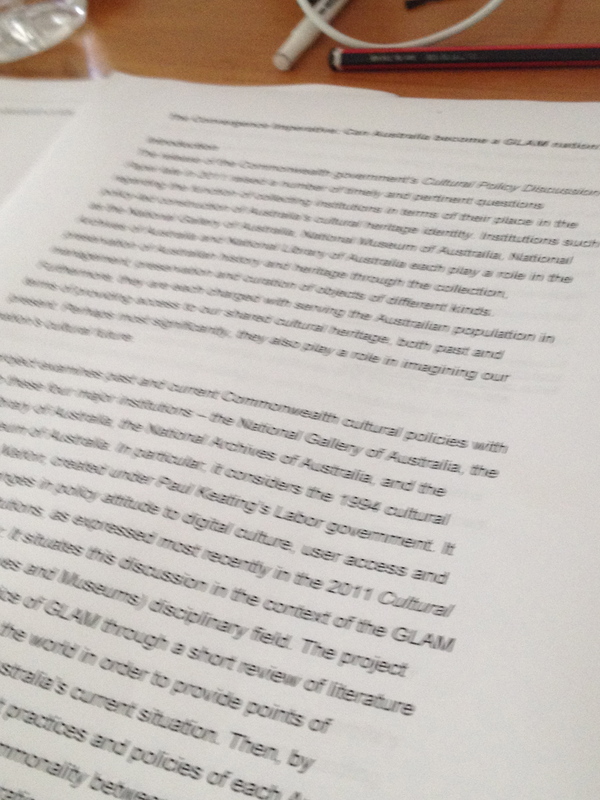 I spent the summer term reading about all things GLAM, cultural policy for collecting institutions and cultural heritage in Australia and just generally finding out more about the NGA, NLA, NAA and NMA. I also discovered a liking for policy documents (who would have thought?!) and am keenly awaiting the release of the commonwealth government’s cultural policy. I read and re-read with great affection Creative Nation. I also racked up a huge fine from my local library because I had Creative Nation out for three months, kept forgetting to renew it. Finally, last week they sent me one of these emails where they tell you the replacement cost of the item in a very stern tone. I don’t know what the rush is for them to get it back. I can see from the inside cover that no-one had borrowed it since 2001. It was date stamped. I’ll take it back tomorrow and ask nicely if they will remove the fine. You would think they would have been thrilled someone actually wanted to borrow it. Anyway, silly details aside, I am very glad that I did this project over the summer. While there were days in January when I was on holidays from work and just wanted to do nothing that I had to grit my teeth and plug away at it, I knew it would be a relief to have it completed. If I am very good, work hard and stay on track I can be finished my Masters by the middle of 2013. Exciting. In the meantime, I will continue to follow the debates about the GLAM sector with interest and hopefully have the opportunity to develop my skills and knowledge more in this area as I continue through the next 18 months and beyond. 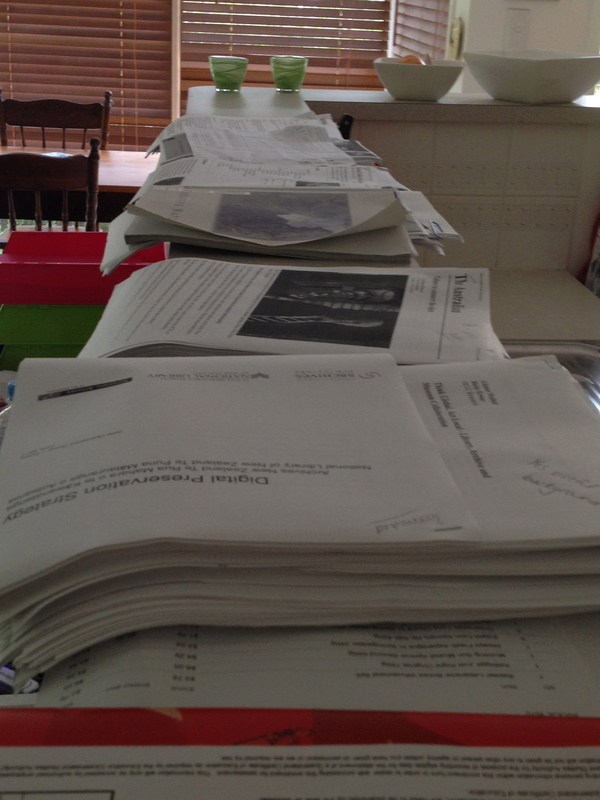 And finally, on the domestic front, I can finally clear away all the bits of paper and readings that have been cluttering my desk and the kitchen bench since November. I will have surfaces once more!